Sometimes biographies about musical heroes read like substantially expanded Wikipedia pages, told in chronological order and sticking to the dry musical facts: albums, hit songs, big concerts, and record deals. Maybe some juicy gossip. 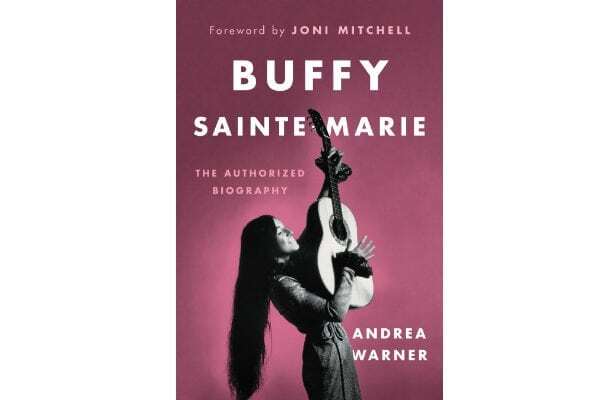 Andrea Warner’s authorized biography of Buffy Sainte-Marie is not that kind of book. While it does its best to nail down some basic facts about the folk legend’s life – not an easy task seeing as birth records for children born on Canadian reserves in the 1940s were often non-existent, lost, or destroyed – its primary concern is to paint a full-bodied portrait of a remarkable forward-looking woman who is as much activist as musician. It also reads like a decolonization manifesto, with Sainte-Marie at the centre, optimistically but not naively doing her best to share her knowledge and make change. Why is it that we’ve known so little about Sainte-Marie, whose name and image so many of us have been familiar with since episodes of Sesame Street from our childhood? Why is it that a singer-songwriter who wrote some of the most powerful protest anthems of the ’60s was never even invited to Woodstock? Why is it that a musician who won an Academy Award for best song (for the Officer and a Gentleman tune “Up Where We Belong,” co-written by Jack Nitzsche and Will Jennings) doesn’t have a hit most of us could name or hum the melody of? Why is it that the person who made the first quadraphonic electronic vocal album way back in 1969 is never mentioned as a pioneering electronic artist? From the first page of Warner’s book, we begin to get a sense of the ways in which Sainte-Marie, now 77, has rarely been “asked to the party.” Outsider status began at birth, when she was adopted out of a Saskatchewan reserve and into a visibly white American family (her adoptive mother identified as part Mi’kmaq; Sainte-Marie is Cree) living in Massachusetts. It continued into her lonely teens, where she faced bullying, and into her college years studying to be a schoolteacher. It was alive during her decades of recording and performing music, most notably during the 1970s, exactly when her star should have risen highest. Instead, she was allegedly blacklisted by American radio stations, along with other Indigenous musicians, especially those involved in the American Indian Movement (AIM). And so, for 50-plus years, with good humour and zero bitterness, Sainte-Marie has gone on her own – partly because it’s her natural impulse (her first record was called It’s My Way!) and partly to survive patriarchy, colonialism, and systemic greed, subjects tackled head-on throughout the book. “Colonialism doesn’t just bleed Indigenous people; eventually, it bleeds everybody except the jerks who’re running the racket,” she says. Vancouver-based Warner, an associate producer at CBC Music, is amply aware of the decolonization discourse happening across North America and of the new wave of Indigenous music and art well underway. Some colonizers are finally starting to hear and consider the message of resistance, unity, and Indigenous pride Sainte-Marie has been expressing since the ’60s. Because of this, Sainte-Marie has become far more visible lately. She took home the 2015 Polaris Music Prize for her electrifying Power in the Blood album, which also won two Junos. Her riveting introduction of Tanya Tagaq and A Tribe Called Red at the 2017 Junos (in the middle of “Canada 150”) went off-script when she acknowledged that Ottawa is on “un-surrendered” territory of the Algonquin and Anishinaabe Nations (the producers had wanted her to use the government-sanctioned term “unceded”). On the same broadcast, Sainte-Marie was presented with the Allan Waters Humanitarian Award. This well-rounded and thorough authorized biography is perfectly timed – not just welcome but vital. It blends past and present through archival newspaper reviews and present-day interviews with Sainte-Marie and a dozen peers and friends, including Robbie Robertson, Elaine Bomberry, Taj Mahal, and Randy Bachman. Joni Mitchell contributes a foreword. One-page “interludes” occur intermittently and feature Sainte-Marie’s thoughts on fame, happiness, and surviving childhood sexual abuse (a topic she discusses but in a limited way). The overriding arc is chronological, but the timeline shifts freely and artfully in places, with plentiful quotes from Sainte-Marie, who gave more than 40 hours of her time and allowed Warner access backstage and on the road. We learn about her early days in Greenwich Village, her views on AIM’s eventually fatal trajectory, bad record contracts, and bad marriages. And the section on Sesame Street is beautiful. Warner wisely sidesteps rags-to-riches clichés; Sainte-Marie’s life has been far more complex than that. Plus, you don’t get the sense she’s made a lot of money. She spent 10 years and $25,000 just to regain the rights to “Universal Soldier,” a song she wrote that was popularized by Donovan. And she’s used her own funds to give scholarships to Indigenous youth and build her Cradleboard Teaching Project, which brings Indigenous curriculum into schools. Warner understands how intrinsically art and activism coexist for Sainte-Marie. There wouldn’t be one without the other. That’s the major takeaway from a book that, guided by Sainte-Marie’s hand, is actually one more collaborative activist/creative act.